โรงแรมมีทำเลดีมาก เหมาะกับนักธุรกิจที่ต้องการไปแสดงสินค้า เพราะใช้เวลาน้อยมากกับการเดินทาง เพียงสามนาทีก็มาถึง Sky Train ที่เพิ่งสร้างเสร็จ ช่วยประหยัดเวลาได้มาก และไม่แพง ภายในห้องพัก มีความสะอาด และกว้างขวาง มีทีวี ตู้เย็น เตา และเครื่องซักผ้า ข้อเสียคือไม่มี internet ให้ใช้ใน Lobby ต้องนำ Laptop ไปด้วยเท่านั้นจึงจะสามารถใช้ Internet จากในห้องของตนเองได้. อาหารเช้าก็อร่อย พนักงานบริการดีมาก. First and foremost, no kitchen here in this facility; a prepared breakfast of selected items was served daily. Secondly, for a late checkout request (normal is 12 noon and I wanted it at 7 pm); they said they would charge half of daily rate; I had booked the hotel at daily rate of AED 220 per night. But they said that their rack rate is AED 450 and they would charge AED 200 for additional 7 hours of stay. No ethics and no sense of customer service. Was not happy at all; the daily room cleaning and replenishment was worse; in fact, many a times, we would have to request; the last day when they charged extra they did not clean the room. Kasim the pool attendant is the star in this hotel. Very helpful guy, always in for a conversation. Always with a smile and lots of advice. The night reception guy is not very helpful and. It friendly. 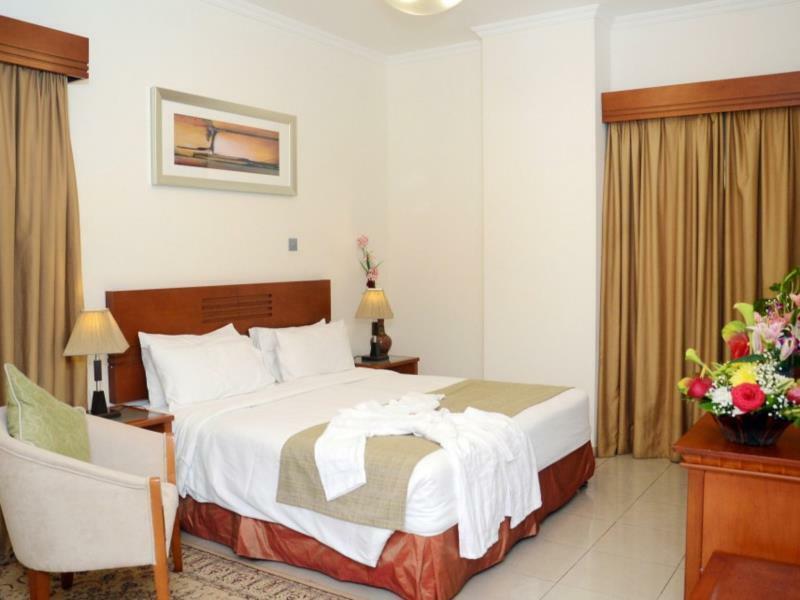 Hotel is close to metro station, resto and supermarkets. Worth the money I paid for. Pros : Very strategic location. The hotel is situated at the Red and Green intersection of the metro line. It takes only 13 minutes from Airport Terminal 3 to Burjumnan station. From Burjuman station to Burj Khalifa/Dubai Mall station only takes 12 minutes. The station is next to Burjuman Mall which is only 200m from the apartment. The staff are very friendly and easy to deal with. We booked 2 small rooms without knowing that there were no connecting rooms available. Because we have small children we were upgraded to a bigger apartment which was a pleasant surprise. Cons: Nothing actually. I am very happy with my stay. I have to give 4 stars for the facilities because the ladies room is situated on the top floor (7th) instead of the lobby area. A little bit of inconvenience especially when we arrived at the apartment at 5:30am and the standard check in time is around 2 pm. I’ll will not hesitate to go back to the same apartment for my next visit. Highly recommended. The place is very spacious and it's very suitable to families specially for those with small kids. It's location also is strategic. It is accessible to public transport, hypermarkets and restaurants. It's convenient and affordable. I stayed here for a week along with infant and kid. Apartment has all the necessary facilities in working condition. Staff is helpful and kind. Everyday room was cleaned. Plus point is location, it is nearby metro junction and mall, 5 min walking distance. I would recommend this hotel apartment, if you are traveling wit h kids or if you want to stay long. Excellent value for a huge apartment! Furnished extremely well with separate living, dining, and kitchen areas. Our unit had 2 bathrooms and a washing machine. Staff were kind and helpful. Quiet location, very close to both metro lines and within walking distance of the Al Fahidi area for cheap eats and the Al Fahidi historical neighbourhood. 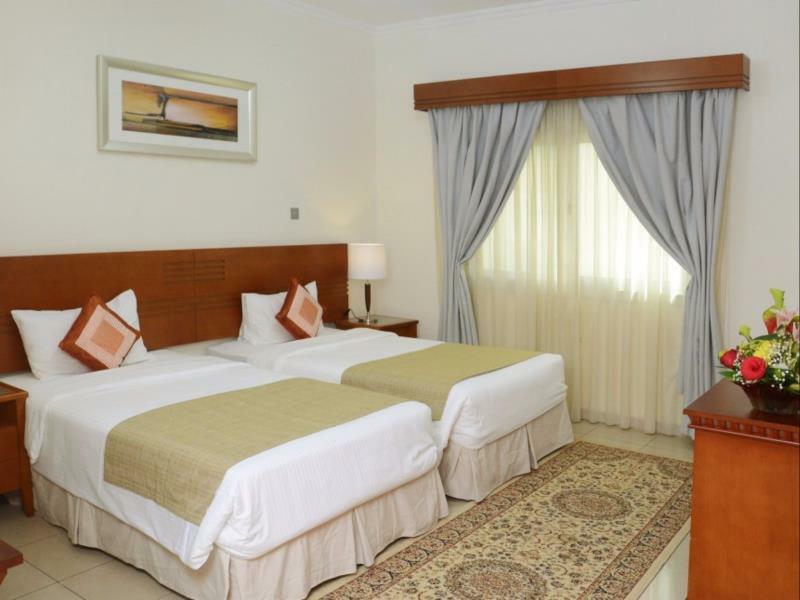 Greetings from Rose Garden Hotel Apartments Bur Dubai. Thank you very much for your recent stay with us. We are pleased to read your comment and we will strive hard to keep the services above our guest expectations. - By Management. Very nice place with a big room , I couldn’t believe as the price was very affordable! They were very nice to let me check out a little bit late as I was stuck in the traffic. I very recommend this place to anyone!! We were on family outing with young kid and elderly parents. We had awesome experience. 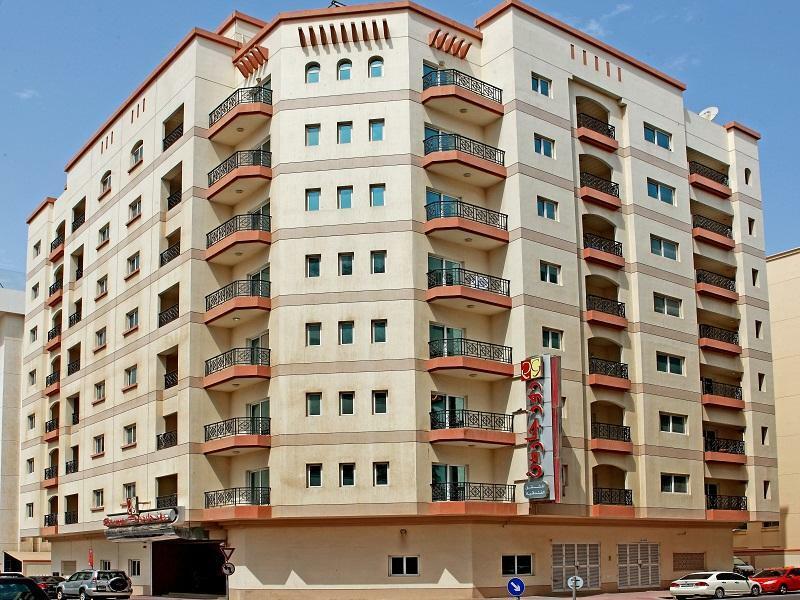 Hotel is right in heart of bur dubai. Metro is on walking distance, grocery store Burjamann mall at stone throw away. Very helpful staff. Surely visit again. We found the Rose Garden was perfectly placed very close to large shopping complex (Burgiman) and Metro Station (short cut through shopping centre, centre carprk, across road and one street away from hotel). The staff were exceptionally helpful at checkin, checkout and during our stay (4 nights). Apartment was very large with all amenities and very clean. I stayed with my family with an infant for 6 nights. Overall we felt very homely. The 2 bedroom apartment was fully equipped with washer/dryer and dishwasher, not to mention a fully loaded kitchen with a full size fridge. The master bedroom had its own attached bathroom. There is another common bathroom too. The beds were comfy and the linen were like brand new. The location is excellent. It is 3 min walking to Burjuman Mall which has better discount stores than Dubai Mall. There is also a grocery store nearby that will deliver all kitchen groceries within 5 minutes. In addition, Carrefour Supermarket is located adjacent to Burjuman Mall! The staff went out of their way to help us especially Sameer and the other front desk staff whose name I forgot. Suggestions: 1. The TVs should be larger size. 2. The tour desk girl did not provide satisfactory service. I booked for just 1 night stay at this hotel, but after the first night I couldn't help but book 3 additional nights. I thoroughly enjoyed my stay. Upon arrival from the airport, we were so tired while waiting at the reception, they served us very cold drinks (complimentary). Upon check in, we were surprised with how clean and well furnished the hotel was. They had beautiful robes and slippers, vanity kits, kitchen appliances including a dishwasher! How easy can life be in Rose garden hotel? A dishwasher makes life much more easier especially considering that we were a large group and we had lots of dirty dishes after each meal. I had a complaint on the 2nd day and Jahir (the manager) instantly offered to upgrade me to a 0ne-bedroom apt for free. I must confess, Jahir provided unequalled service through out our 5-day stay and by the time I checked out, I was a very happy client. Thumbs-up to the entire team at Rose Garden hotel, you made our stay very pleasant. We will surely be back. Clean, Big and good location! We felt price was bit higher for that location but very convenient and staff were very kind. It is located right behind Burjuman Mall and can be easily found. Metro station is walking distance, making life easy. The room is very clean, well equip with kitchenette and many good things such as washing machine, big refrigerator, stove and etc. Staff are very good, kind and helpful. Will come back to this hotel when we visit Dubai again. Excellent Basics if you are looking for a business stay or wishing to go out for different spots with a comfy stay at the hotel.. no fancy stuffs.. I stayed in this hotel for 49 nights in a studio (202).. The studio has mostly all the required facilities for me to stay for the whole period being satisfied with my stay (as mentioned in the room description). -- Cons: small kitchenette, no couch - location of the hotel is the best thing for my stay, as I don't have a car. Just behind Burjuman Mall. Carrefour hypermarket inside the mall. Intersection Metro station few steps from the mall. Spinneys and Centerpoint are 10 min walking as well Many satisfactroy restaurants and shopping stores in Burjuman Mall The surrounding area is very alive Hotel Staff try to provide help as much as they can Construction is infront of the hotel and may stay for months. for me I wasn't disturbed by the construction. Maybe the 1 bedroom apt suffered from noise as they are directly located infront of. Basic apartment style rooms located a few blocks from the Burjuman metro stop. The pool on the roof was a nice place to relax in the afternoons. The studio apartments only have a hot plate with a single burner, so if you plan to do much cooking, I'd opt for a larger room. 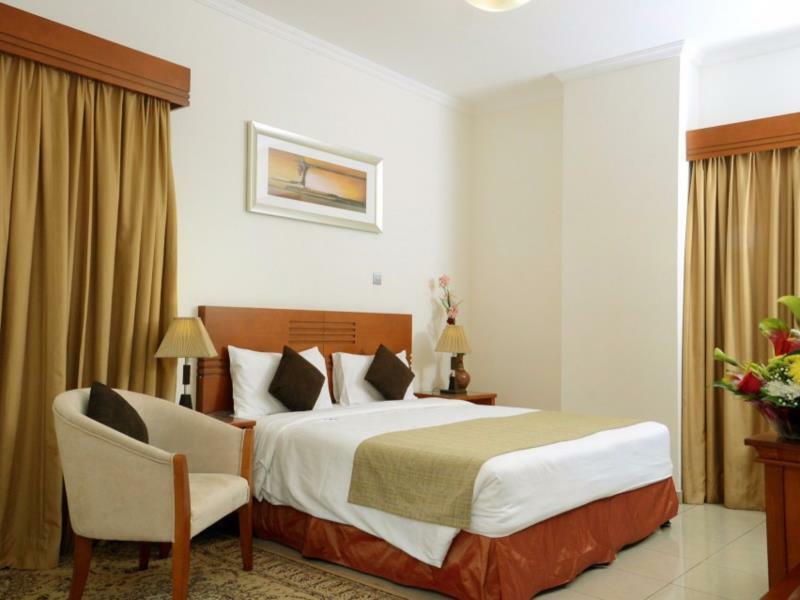 Spacious rooms with good facilities. Daily housekeeping, which is missing in most of the hotels. Convenient location to access restaurants, supermarkets etc. Good swimming pool with good timing (life guard was very friendly and polite. While checking out, we met a gentleman (i believe that he is the front office manager) who spoke to us in a very friendly and respectful manner. Only negative thing is that I feel that the ground level parking is a bit congested (I am not sure about the basement parking). Overall its a very good apartment to stay with family. สถานีรถไฟใต้ดิน Burjuman - ระยะ 0.31 กม.